Impala, aka KB’s Impact, is a 4.5 year old brindle female born June 3, 2014. Her sire is Dodgem by Design and her dam is Flying Chiefland. Impala has 72 races according to greyhound-data.com starting on January 29, 2016 at Tucson Greyhound Park in AZ before moving on to Mobile Greyhound Park, Sanford Orlando Kennel Club and finishing at Mobile in AL on February 15, 2017. Impala is ready to relax at home with her family now. Impala is not cat or small animal tolerant at this time. 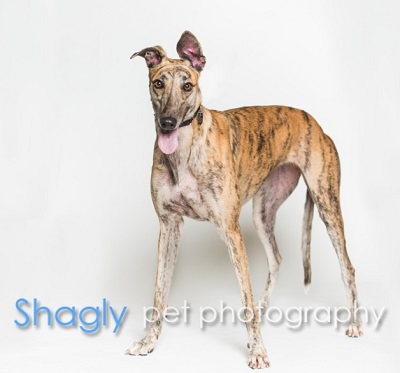 Impala is a beautiful brindle girl with a sweet personality. She is not very confident so would do best in a home with at least one greyhound. She is great with other medium sized dogs though probably not be small dog or cat safe. She has come a long way in foster care, starting out with a startle whenever there was an unusual sound or movement, to now trusting what is familiar to her. She loves to go for walks and stays perfectly by your side while enjoying the exercise. She crates well but doesn't need to be crated. Impala is well house-trained and has never had an accident indoors. She could live in an apartment although she definitely enjoys the backyard and will take an occasional spin when it suits her. She will come when called as soon as you crouch down and call her name. She likes to ride in the car and will readily jump in and enjoy the ride. Impala needs a home with confident leaders that will help her advance to all that she can be. She has been around young grandchildren but she is afraid of them and prefers to stays away. 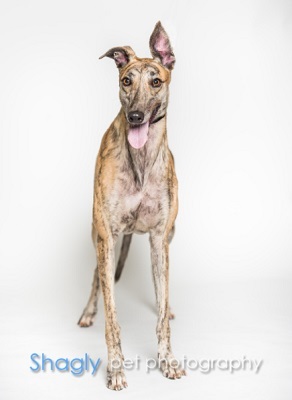 Ideally, her perfect home would be in a calm household with adults and preferably a male greyhound that is not too bossy and will give her guidance.